This page explains a few of the major changes. For a list of all changes in the new release, see this Knowledgebase article. You can also use What's New section at the back of the ProSelect 2017r1 Reference Manual (quick access under the Help menu in ProSelect) to access the relevant new or updated sections of the manual. You can now change the color theme of ProSelect's main window (under the View Menu). Below are some of the new themes that we have created... with more to come! We have added new rooms, templates, styles, music, stamps & watermarks, notes and lots more to this new release to make it "ready to use" when first installed. See the What's Included page for more about the new included resources. 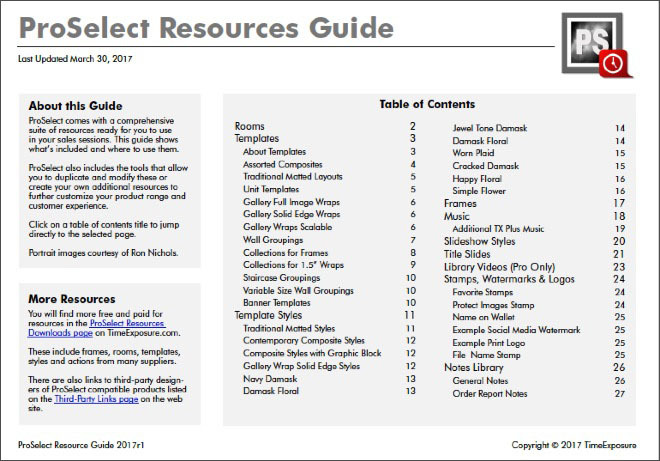 We also added a new ProSelect Resources Guide.pdf (under the Help Menu in ProSelect) which lists all the included resources and how to access and use them. If you are upgrading from an earlier version of ProSelect, you can selectively add these extra resources to your existing setup using the ProSelect Data -> Install 2017r1 Default Resources option (under the File Menu). Handling digital files as part of your client's order is now as simple as with other products. Just setup one or more price list items under the new Digital Files tab specifying the description, maximum output size (in pixels) and whether they are to be priced as a group or on a per image basis. You can even create associated Extras to add that professional touch. Ordered digital files appear under a new tab in Hi-Res Production (requires ProSelect Pro), where you can use standard re-touching workflow before exporting fully rendered files, with cropping or effects automatically applied, ready to deliver to your client. ProSelect integrates with TimeExposure's new SendMyRooms™ system. Have the system send your clients a password-protected link to this mobile-friendly web site where they can watch a video guide on how to use the camera in their phone or tablet to take and upload photos of their rooms. You can then download the images directly into their ProSelect album file, ready to be calibrated and used in the sales session. You can brand your SendMyRooms™ site with your studio details and even have it send your clients a gentle email reminder to upload some images if they haven't already done so before their viewing date. This new service is part of the new TimeExposure PLUS program and available for free to all current TimeExposure PLUS users. 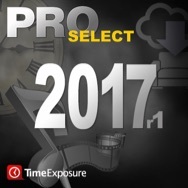 Apart from the 12 free music tracks included with the 2017r1 release, TimeExposure Plus program members now have access to over 40,000 royalty free music tracks that you can use for your ProSelect slideshows, ambient music (in ProSelect Pro only) and exported, fully saleable, slideshow movies. 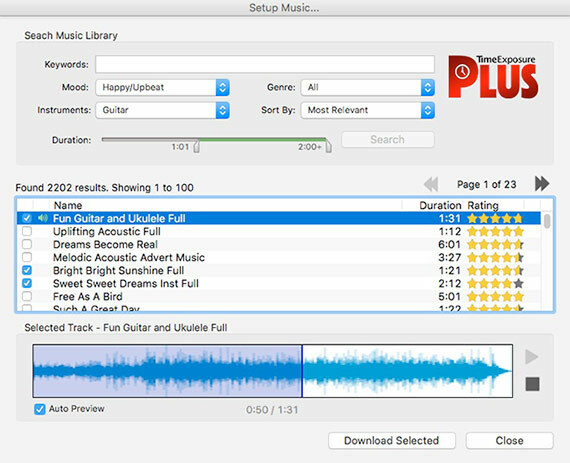 You can search for, preview and download music directly into ProSelect's Setup Music window. It's now even easier to be creative with direct access to over 200,000 high resolution royalty free graphics elements that you can use to build unique products. Use these for matt backgrounds, graphics block and overlay images (some editing may be required). 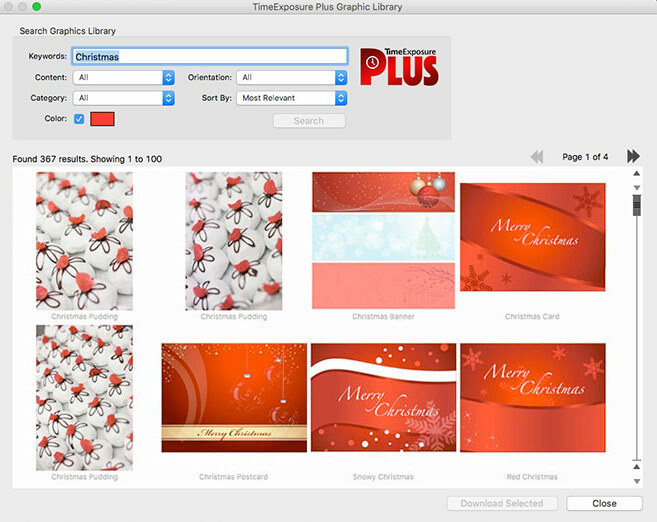 These elements are free to download for all TimeExposure Plus program members. Zooming in now takes advantage of the free space in the Display Area to show you more of the zoomed image. Zoom in by 1.5 times increments on every right-click or 2 times when you hold down the Alt/Option key. 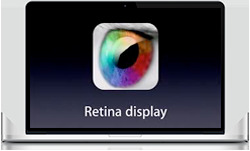 ProSelect now supports the higher resolution displays on Macs with retina displays. Text, controls and thumbnail images now display with greater clarity. 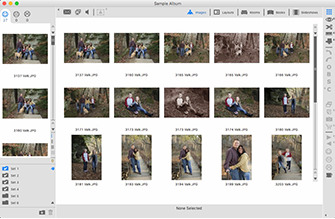 Large images will be displayed at the maximum resolution available dependent on your imported size settings. 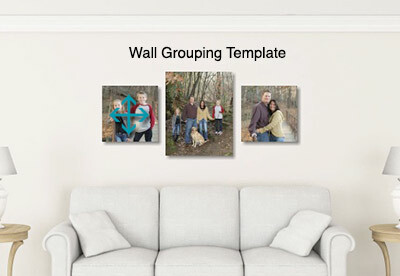 You can now set the crop of all your selected images to any aspect ratio based on your setup Print Paper Sizes. You can also optionally select that size to be the default starting size when images are shown at actual size in Select Size view or in a Room. 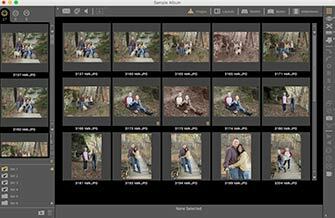 Just choose Crop To -> Other Crop Ratio... (under the Edit menu) to open the new dialog. 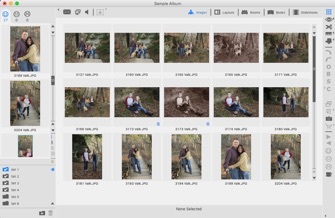 The last selected Crop ratio is automatically stored as your latest Saved Crop so you can easily apply it to other images using the Crop to -> Saved Crop menu or the keyboard shortcut Shift-Cmd-V (on Macs) and Shift-Cntrl-V (on Windows). As with Prints, you can now use Alt/Option-drag to adjust the crop position of an image in a layout while in Show Layouts View (when Working with Layouts) as well as in Show Rooms View (when Working with Rooms). This is a great for quickly re-positioning images which you have just added to or changed in a layout without needing to leave Working with Rooms. To help you get the job done faster, ProSelect now takes advantage of the multiple cores in your computer to import images approximately three times faster on a computer with four cores and two times faster on a machine with two cores. ProSelect is no longer dependent on Apple's Quicktime on Windows computers and, as a result, movie exporting is now 5 to 10 times faster than when using Quicktime. Note that exported movies using Ken Burns effects do take a little longer than those without this effect. The Setup Stamps, Watermarks & Logos window now allows you to select a print paper size (and orientation) to find out a stamp's actual size and offset in inches or millimeters when added to that sized print. This window can now be also resized to show a larger preview image. The maximum number of Custom Effects Actions that you install in the Pro version has been increased to 100. ProSelect Basic allows up to 5 actions as before. The Recent Albums Menu now shows the last 20 albums opened. Also, rather than hiding any missing or inaccessible albums, these are now listed with a caution icon (except for items in the trash). 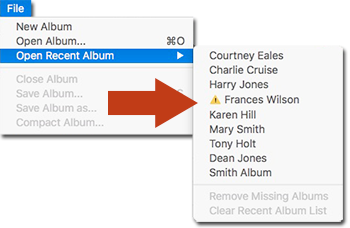 Selecting a missing album will display its previous location and give you the opportunity to Try Again (after you have re-mounted a network location or drive) or just remove it from the list. The color of the icons in the left hand column of the Place Order window now indicate the type of ordered item. As before, clicking on these triangles expands the item to show the included images. In the Place Order Window, when adding a new order, holding down the Alt/Option key while clicking on the Quick Add, Add with Extra or Custom Product buttons will automatically prompt you to add a note to the ordered item immediately after the ordering has been added. To avoid unintentional errors, this only works when ordering one item at a time. "I, [CLIENTFIRSTNAME] [CLIENTLASTNAME], commission [BUSINESSNAME] to create the portraits shown and I agree to pay for these portraits in accordance with studio policies." "I, John Smith, commission The Portrait Studio to create the portraits shown and I agree to pay for these portraits in accordance with studio policies." Love using another Photo Editor? You can now! ProSelect's Photo Editor Preferences now allows you to choose another application to use for quick edits or retouching. Once set, rather than opening Photoshop or Lightroom when you do a CMD-T (on Macs) or Cntrl-T (on Windows), it will now open your selected image(s) in your selected editor. This will work with any application that supports the standard Open Document call which is the same process that occurs when you drop one or more images onto the application's icon. Note: Photoshop CS5 and newer is still required for Hi-Res Production. The Show Number Display feature can optionally stay on until you press the "N" key again. To do this check the Toggle option in the Preferences -> Borders & Backgrounds -> Selection Number Display. Added New frame price options - Chop Foot 6" and Chop Foot 4" used by some frame suppliers. You can now also enter your framing prices at supplier cos trates with a markup perentage. Image flipping is now also available in Working with Images (when in Cropping View) to complement its use in Working with Layouts. In Working with Slideshows, right-clicking on a video resource (at the bottom of the window) allows you to choose Open the Video in Setup Videos window or Edit the Selected Video from the popup menu. This works the same as right-clicking on a video in the slideshow itself. The Export Sample Images window has been updated to show the maximum image size that can be exported based on it's imported size. 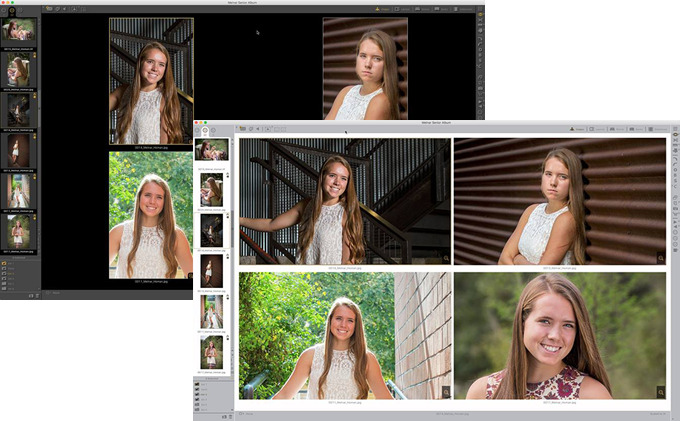 The Hi-Res Production window can now be resized to provide a larger Preview image for fine cropping adjustments. The Template Editor now has a new toggle button (near the top left side) to show the grid over the top of the openings and graphics blocks for easier alignment of overlapping openings. The Order Report Setup window now allows you to optionally include Layout Style names and the Album Name on your reports. 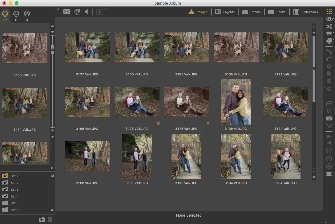 On Macs, ProSelect now uses the OSX's 64bit APIs to allow problem-free importing of .psd files saved from Lightroom. On Windows, ProSelect can now also import 16bit RGB and CMYK Photoshop files. Sort by Width is now available in the Template Manager's sorting options. As with other Sorting options, selecting this while holding down the Alt/option key will reverse the sort order. You can now select a different price list directly from the Quick Order menu by right-clicking on the Shopping Cart icon. In the Place Order Window, clicking on the Presentation Option column header will sort your orders by these values. By default, items will be sorted within Prints and Layouts groups. Holding the Alt/Option Key down will sort across Prints and Layouts. Changed the way the second screen position, size and scaling is detected when running on Windows 8 & 10 so that the Mirror Display Area screen works as expected regardless of the scaling selected for the display's scaled text and/or computers with HiDPI screens such as Microsoft's Surface Pro 4. Added a new preference setting Add Borders if Layout has Wrap/Bleed (defaults to ON) to Preferences->High-Res Production->Styles & Stamps->Traditional Matted Prints. This can be used to automatically add solid edge borders styles to produced prints from Canvas Wall Grouping without needing to change the Preferences when producing these items. At the time of the 2017r1 release, current SUPPORTPlus customers have been automatically converted to the new TimeExposure PLUS for the duration of their SUPPORTPlus period and can enjoy all the new TimeExposure PLUS benefits.